If you’re up for a little winter holiday in NSW but are not necessarily up for braving the snow and ski resorts, Port Stephens offers a prime holiday destination. 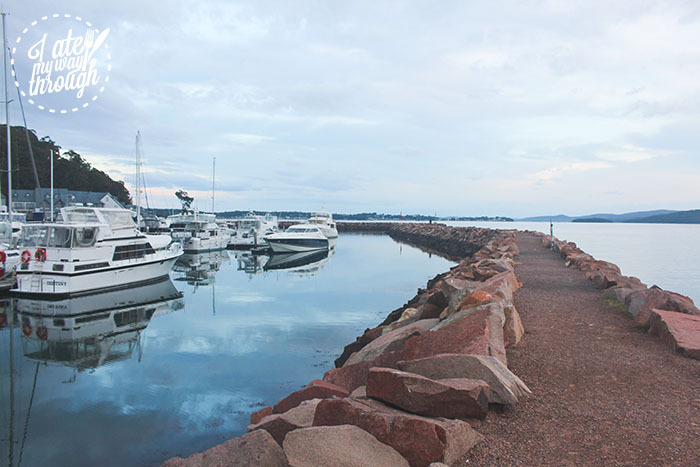 We stayed at The Anchorage, Port Stephens, which immediately captured our hearts. 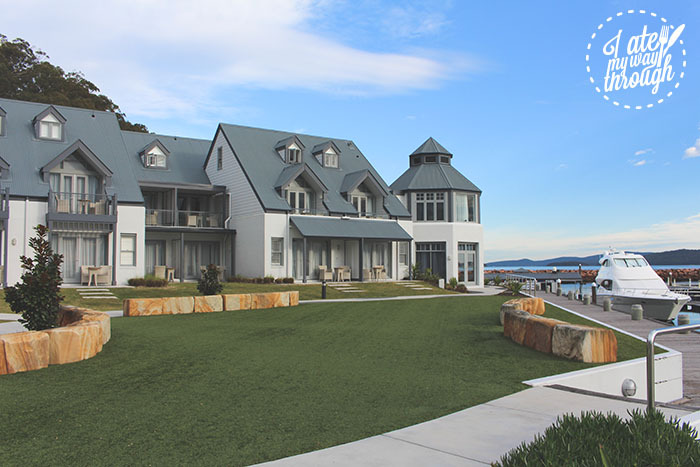 The luxury accommodation is nestled between dense bush land, Corlette Beach and the Anchorage Marina – with no shortage in breathtaking scenery. The rooms and suites themselves are also inviting, with white timber and marble finishes, neutral shades and plush furnishings almost making it too difficult to leave the comfort of the room. 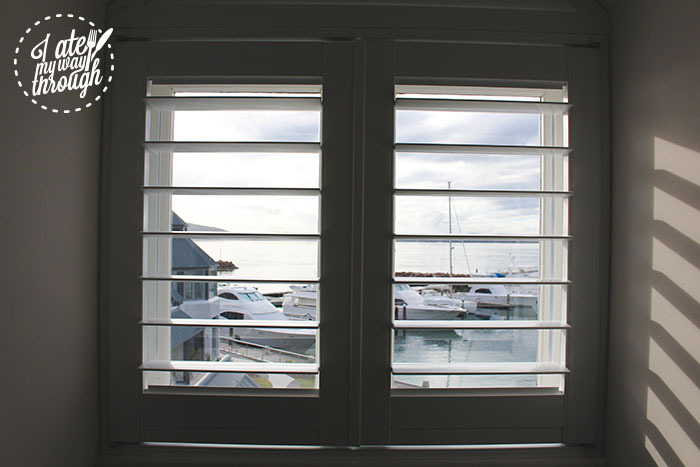 The Anchorage easily provides a beautiful escape for those wanting a relaxing getaway. 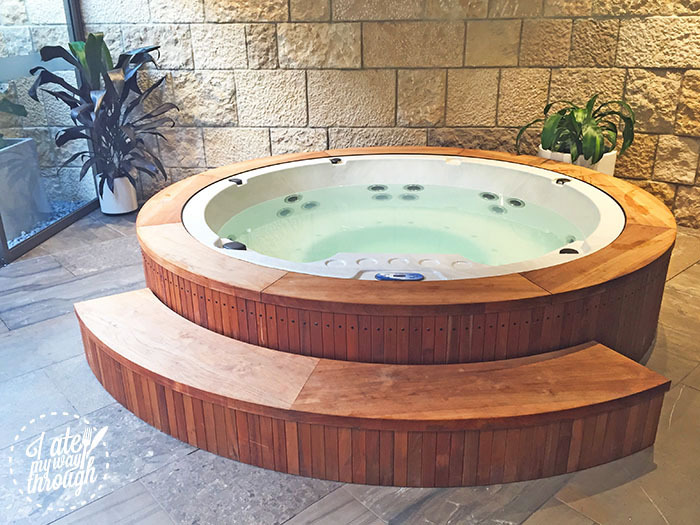 Their on-site spa, Spa Lucca, is a must-visit if you want to book yourself in for a bit of pampering time. They offer a range of different treatments, including massages and facials, which are designed to soothe and rejuvenate. It’s definitely worth coming to your treatment about an hour early to use the facilities, which includes a spa and a steam room. This little bit of ‘me time’ was one of my highlights of the trip. The girls at Spa Lucca were lovely, the facilities and interiors were gorgeous and I left with my muscles happily tender and my skin feeling nourished. The Galley Kitchen’s buffet breakfast overlooking the swimming pool on one side and the marina on the other is also a great way to start your morning at The Anchorage. 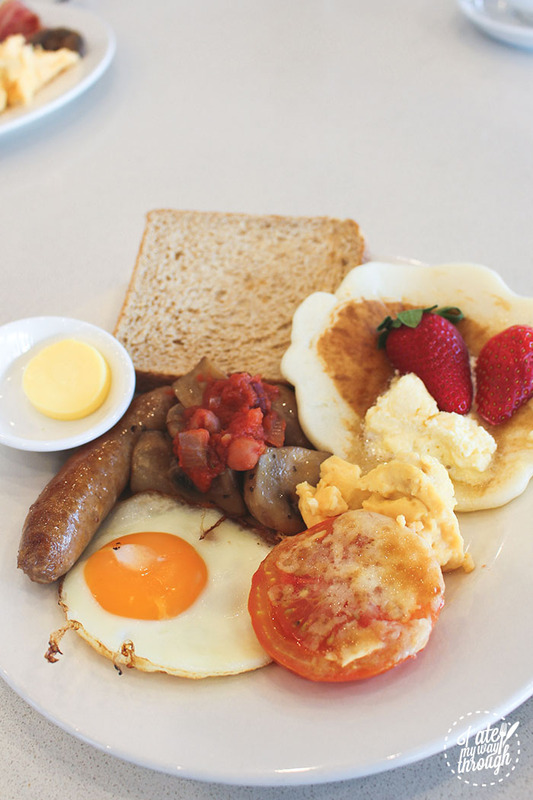 The Galley Kitchen certainly provided the best of the sweet and savoury things you’d expect from a buffet breakfast – think eggs your way, extensive fruit platters, hot meats and pancakes. And as a side note: their automatic pancake machine has left me with a life goal of owning one in my very own kitchen (it was delicious!). I’d also recommend going for long walks up and down the marina. 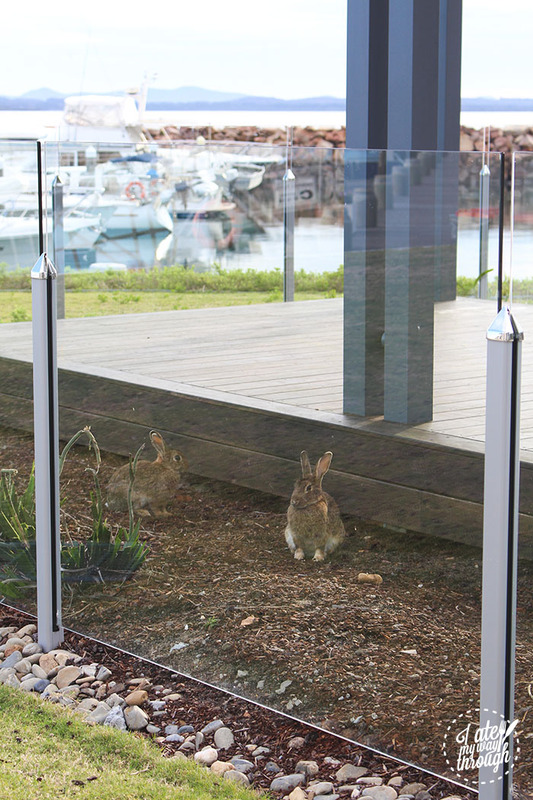 Not only will you be able to admire the dozens of boats anchored there, but you’ll probably also be greeted by a few of the resort’s resident bunnies. 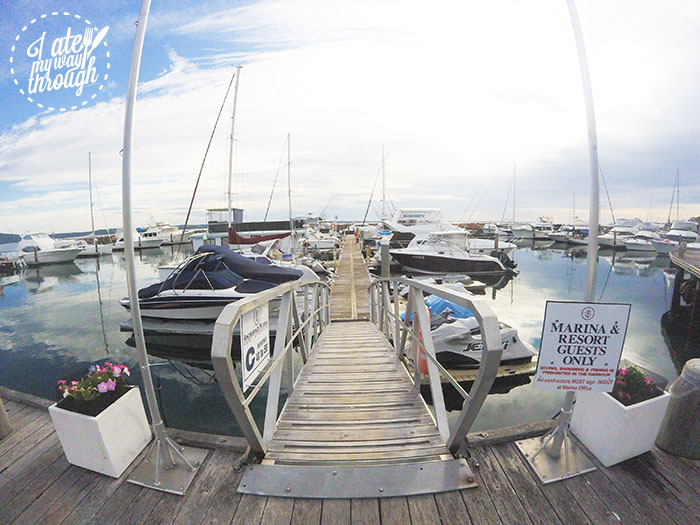 The Anchorage Marina connects to Corlette Beach. 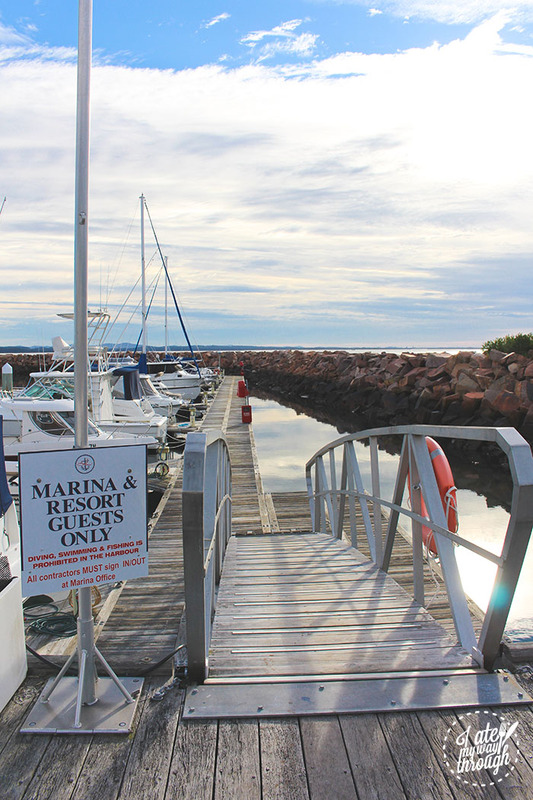 Early morning walks truly showcase the Marina in its most peaceful state. Located on the shores of Little Beach Marina, Little Beach Boathouse has the winning combination of waterfront views and delicious food. 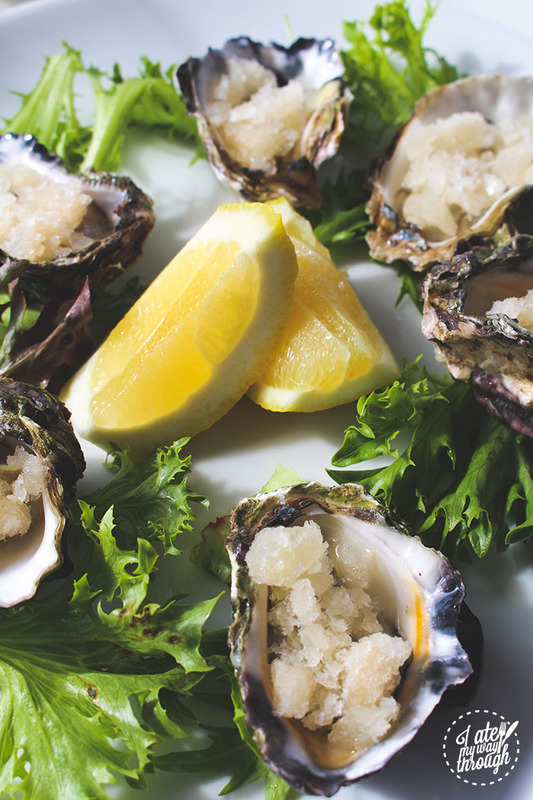 The restaurant boasts modern Australian cuisine made from fresh local produce and seafood. This was on full display when we visited. The Port Stephens Rock Oysters with lychee and white soy granita ($19.50) were an undeniable dining highlight of the trip, with the granita packing the oyster with a sweet but refreshing flavour that worked all too perfectly. We also made an order of the Crisp Pork Belly ($27) and one of the ‘market fish’ of the day, the Barramundi (market price). Also, I’m never one to pass up on dessert and the Dessert Taste Plate ($25) at Little Beach Boathouse really did hit the spot. 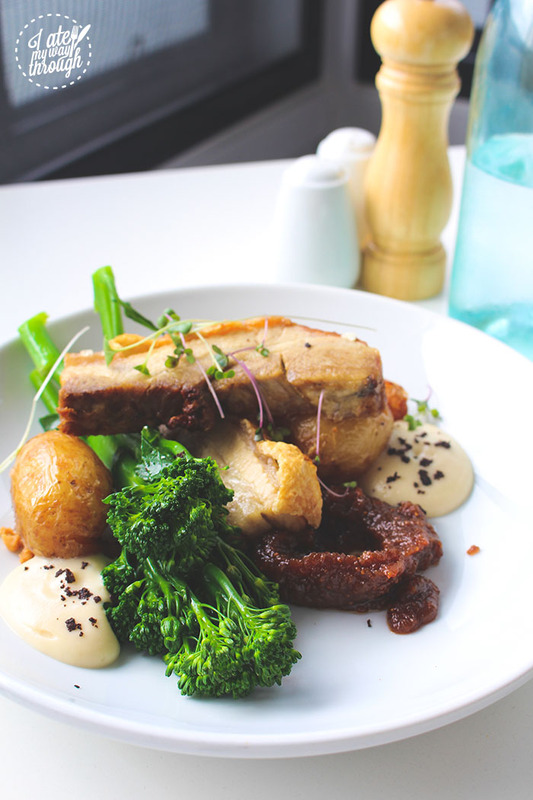 Crisp pork belly with cauliflower puree, broccolini, chat potatoes, fig jam and macadamia nuts. Dark chocolate mousse with coconut snow, date and walnut pudding with caramel ice cream, and rhubarb and white chocolate tart with crystallised violets. 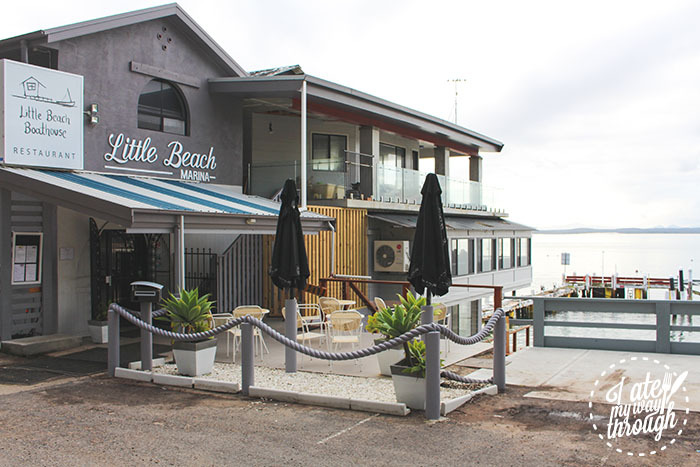 This was actually the first place we visited in Port Stephens and it certainly charmed us from the beginning. The owners are actually opening up a tapas bar at the base of the restaurant in August – definitely a reason for me to revisit! The Little Nel Café is a breakfast lover’s dream. If it were located in Sydney, I could easily find myself there every other day of the week, sampling everything on the extensive menu. But alas, one of the most difficult things about traveling is finding a place you absolutely love but cannot regularly go back to. I’ll have to settle for raving on about how wonderful this café is. Chak Chouka, Tunisian baked eggs with chorizo, tomato, peppers, smoked paprika and sourdough. 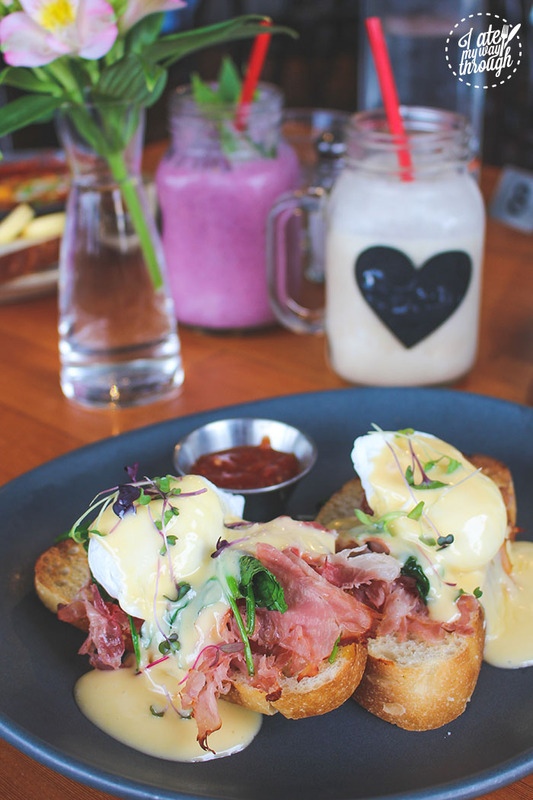 Located at The Nelson Resort in the heart of Nelson Bay, The Little Nel Café is a charming space with even more charming food. 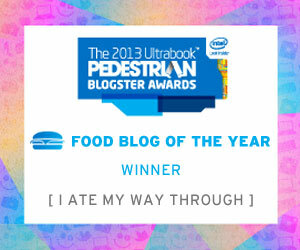 It was truly difficult to choose something off the menu, with so many things jumping out at me. In the end, we settled for the Chak Chouka (Tunisian baked eggs) ($21) and the Eggs Benedict (which we had heard was a fan favourite) ($18). Both were sublime. We also were lucky enough to have the Acai Plate ($18), which proved to be the perfect ‘dessert breakfast’, as it was sweet but light. It also featured coconut cloud, something I have now decided is one of my favourite things in the world. Eggs Benedict, with leg ham, baby spinach, little nel tomato relish and house made hollandaise on sourdough. 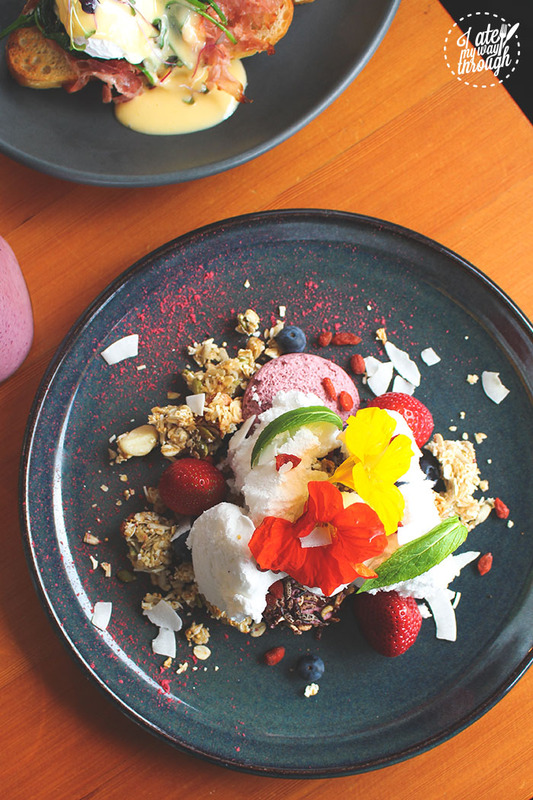 Acai Plate, acai mousse with puffed back rice, coconut cloud, crunchy quinoa and nut granola. Other enticing dishes on the menu include the Buttermilk Pancakes with Persian fairy floss ($18), the Pain Perdu (French toast) made with brioche and honey mascarpone ($17) and the Crispy Sambal Polenta Pavé with avocado and corn salsa ($20). 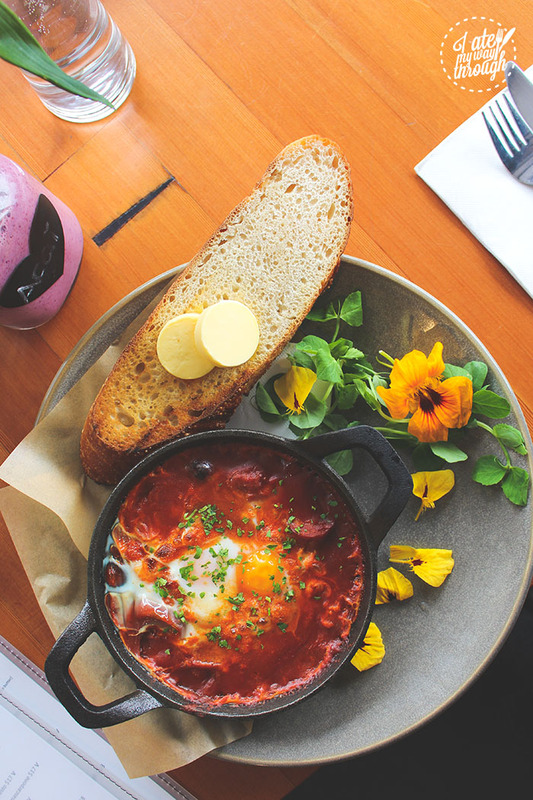 This café truly has your Port Stephens breakfasts sorted. 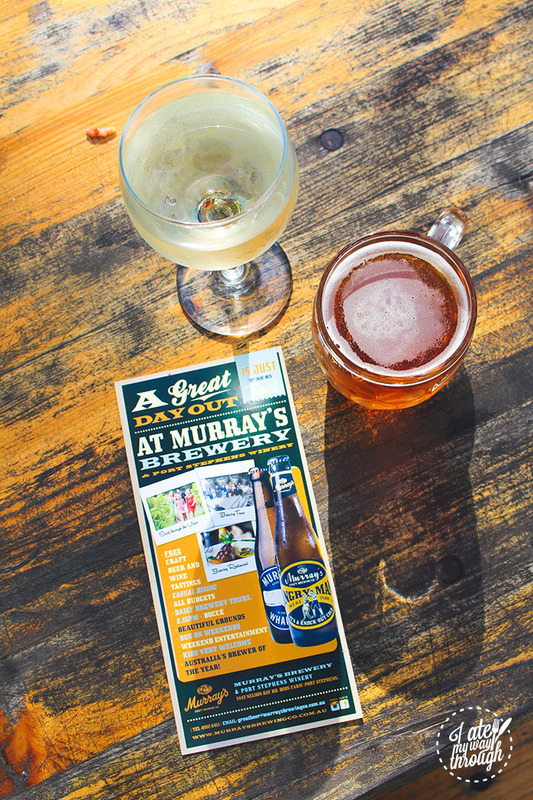 A sign at the front of Murray’s Brewery Co warns that your lunch will be packed with no boring flavours, and this is something they definitely stay true to. The Brewery has a very distinguished American feel to it, with pizzas, burgers and smoked BBQ meats featuring heavily on the menu. 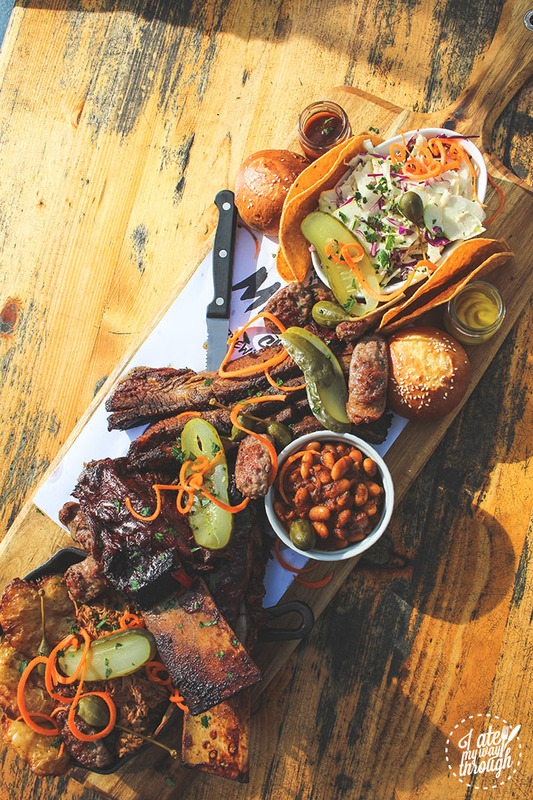 Being the carnivores we are, we ordered the Big Smoke BBQ Share Platter (to share between two determined people) ($55). We were dared that we wouldn’t be able to finish it, so of course we were determined to do just that. It was a challenge, but it was definitely worth it. Big Smoke BBQ Share Platter, slow smoked beef ribs (my favourite of the platter); chipotle pulled pork shoulder; beef brisket; lamb and rosemary sausage; apple, fennel and cabbage slaw; beer cucumber pickles and mustard; Expresso Dark Knight Beer BBQ Sauce; fresh baked brioche slider rolls; corn tortillas and chilli beans. After lunch, it’s also worth going on the quick tour of the Brewery itself, which runs daily at 2.15pm. 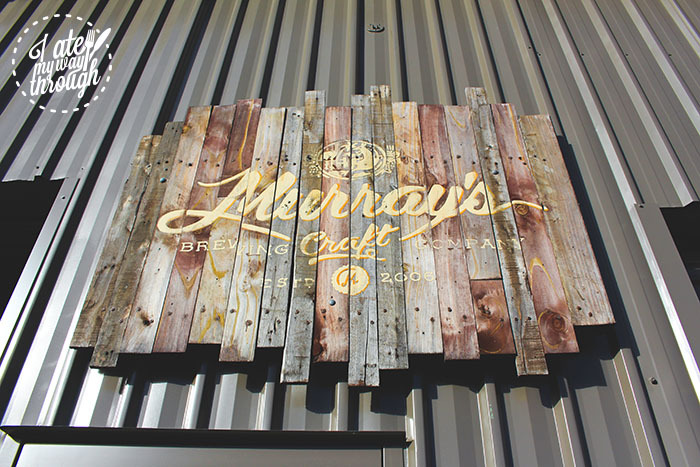 You’ll get to see the different stages in the production of Murray’s Beer and then taste them, which is always a plus. 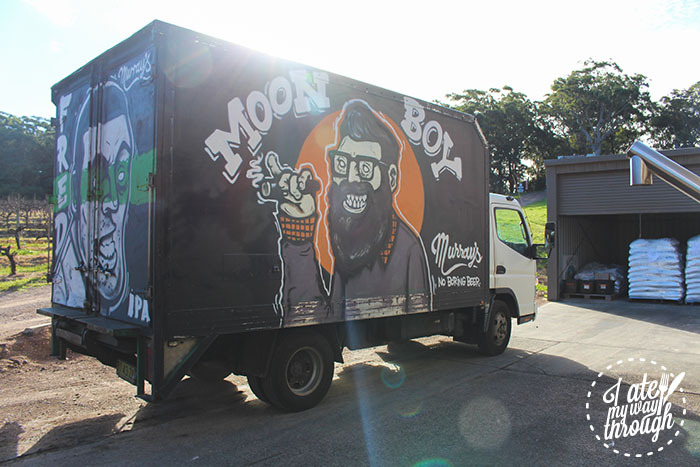 Although I’ve never been a big beer drinker, I can definitely appreciate the rich flavours in a nice craft beer – and Murray’s is no exception. Try Hell of the North for an intense flavour experience, Heart of Darkness for a rich chocolate malt or the Wild Thing for an odd but somewhat satisfying espresso-beer hit. Of course there are lighter beers too like the Murray’s Whale Ale and the Fred IPA, which are definitely easier to drink. Try as many of them as you can – it certainly makes for a fun experience. 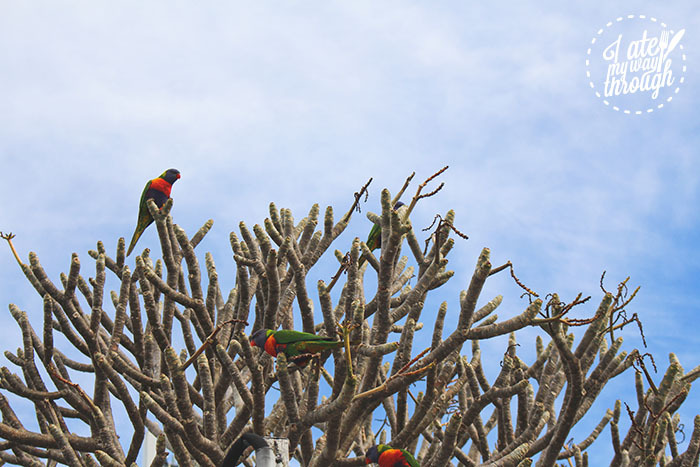 The beauty in the Nelson Head Inner Light Tea Rooms lies in its spectacular views and the cheerful rainbow lorikeets that love to linger in the nearby trees. The cafe offers a range of light meals for breakfast and lunch, including eggs, pancakes, bruschetta, salads and sandwiches. Avocado smash and Chicken and asparagus crepes. It’s a peaceful place to dine, and it’s easy to just sit in the sun and soak up the view for a while. The Inner Light Tea Rooms provide a high vantage point from which you can look out to the various coastlines along the Hunter Region. You probably won’t want to leave. 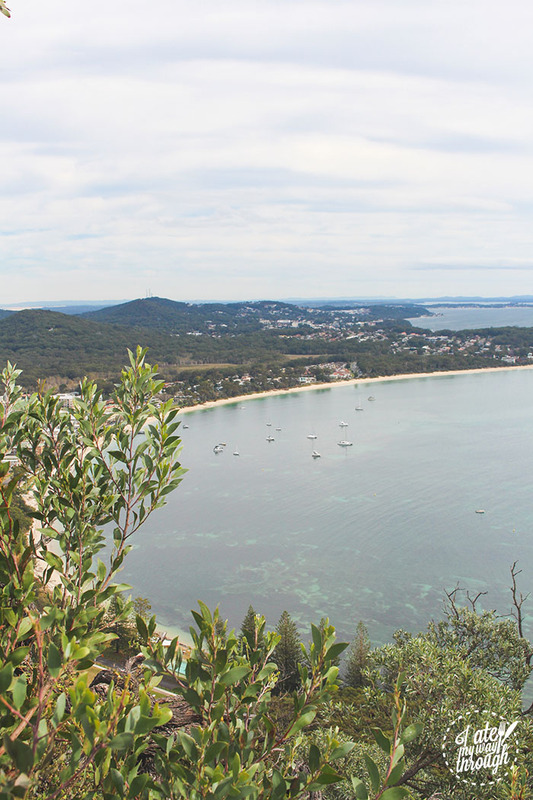 For us, it was our last stop on our Port Stephens trip and we definitely took our time to enjoy the view. 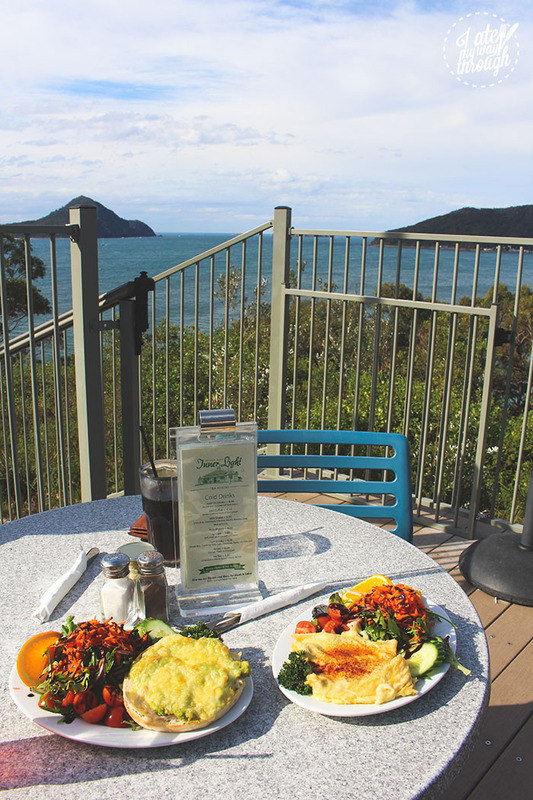 Located at the idyllic Soldiers Point Marina, the Point Restaurant is another Port Stephens favourite for its beautiful views coupled with exquisite food. We dined at The Point for dinner when it was unfortunately too dark to see out onto the water, but enjoyed our visit nonetheless. It was difficult not to enjoy it, what with the delicious food that was brought out for us. 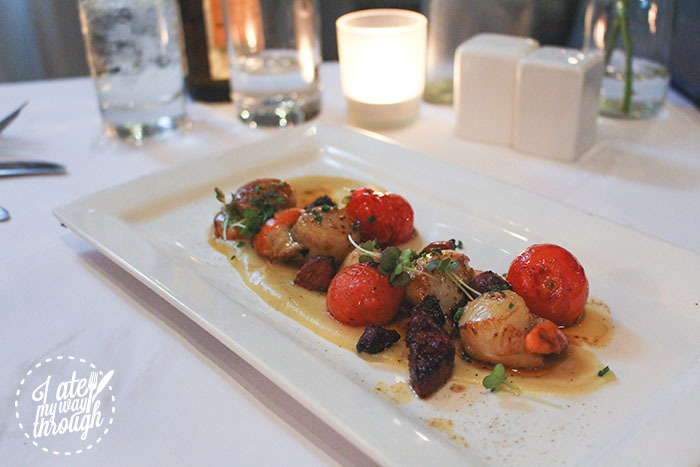 Tasmanian scallops, chorizo, Jerusalem artichoke veloute, cherry tomato and chive, $22. The Point serves the local Holberts Oysters natural with a lemon wedge or with an array of different toppings. We ordered one of each to get a good sense of what was on offer, which we definitely recommend if you feel like sampling many flavours. The mains here were divine. 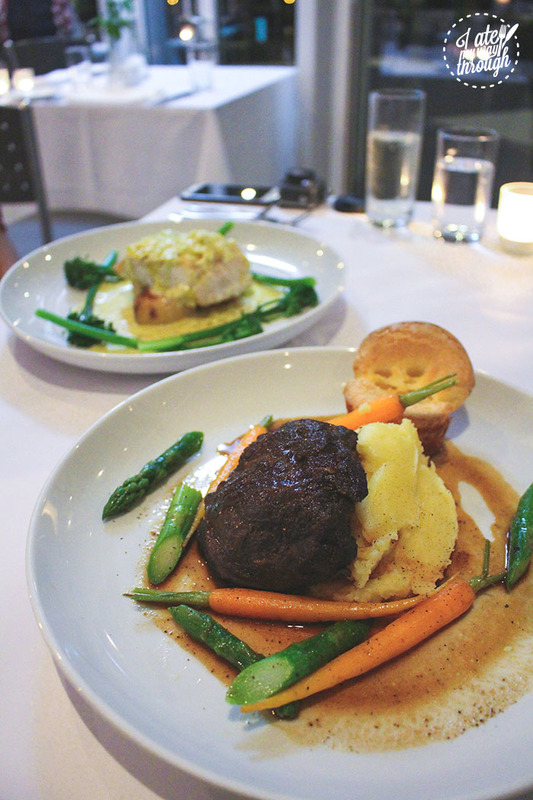 We ordered the Braised red wine Beef Cheeks ($36) and the Blue Cod, one of the market fish of the day (market price). Both were gloriously tender and certainly provided that ‘melt in your mouth’ moment that goes so well with a winter dinner. Braised red wine beef cheeks, Dutch carrots, green beans and garlic mash. Dessert was comprised of the Coconut Brûlée ($17) and the Poached Whiskey Corella Pear ($17). We left the Point with happy (but painfully full) stomachs and satisfied tastebuds. Poached whiskey Corella Pear, dulce de leche, dark chocolate and toasted peanuts. 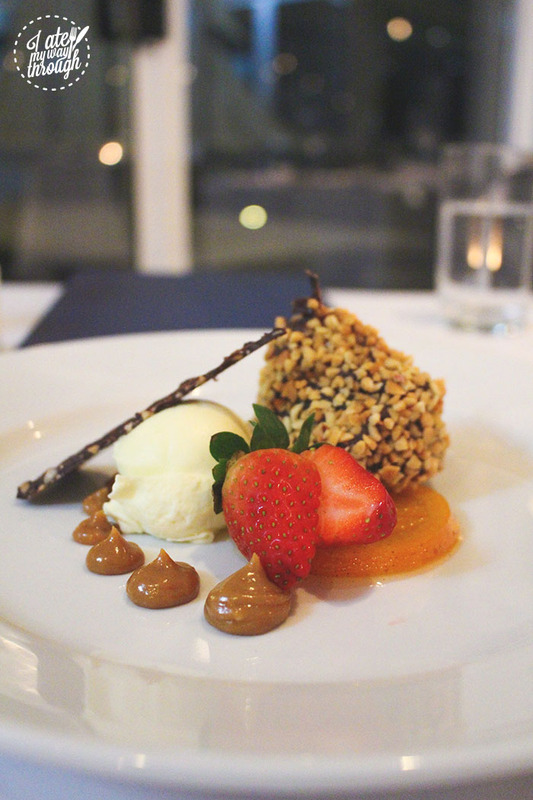 One of the only places we visited without a waterfront view, Sandpipers more than makes up for it with its warm, inviting atmosphere and its modern fusion cuisine. It’s under the same ownership as the Little Beach Boathouse, and while having a decidedly distinguishable menu, the same high quality and richness of flavour that graces the Boathouse is also readily evident at Sandpipers. 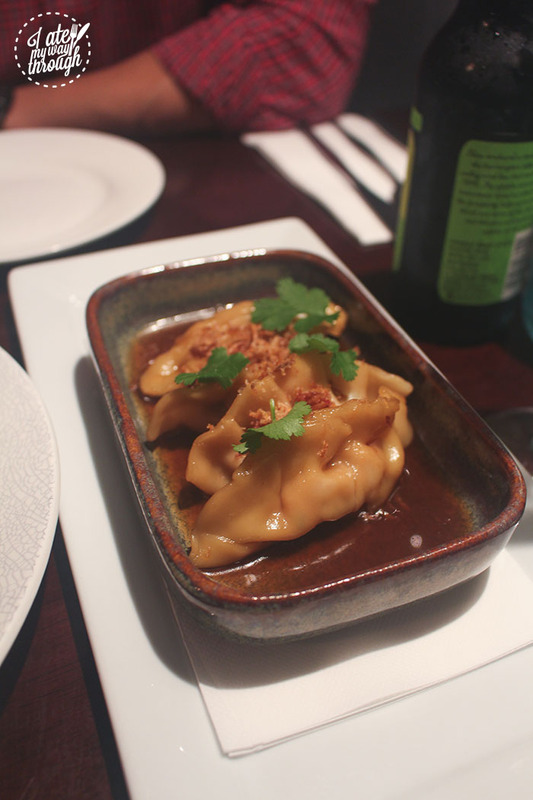 Pork, ginger and chive dumplings with red miso and soy broth, fried shallots and coriander leaves, $16.50. We ate here for dinner and were pleased to find a menu with strong Asian influences – something a little different from the previous places we’d dined at in Port Stephens. Notable dishes on the menu included dumplings, glass noodle spring rolls and Chinese-style Pork Belly. I found the Chinese-style Pork Belly ($33) to be perfectly crunchy and worked well with the garlic butter and cauliflower puree and, for dessert, the Triple Chocolate and Cherry Brownie ($12) was beautifully moist. 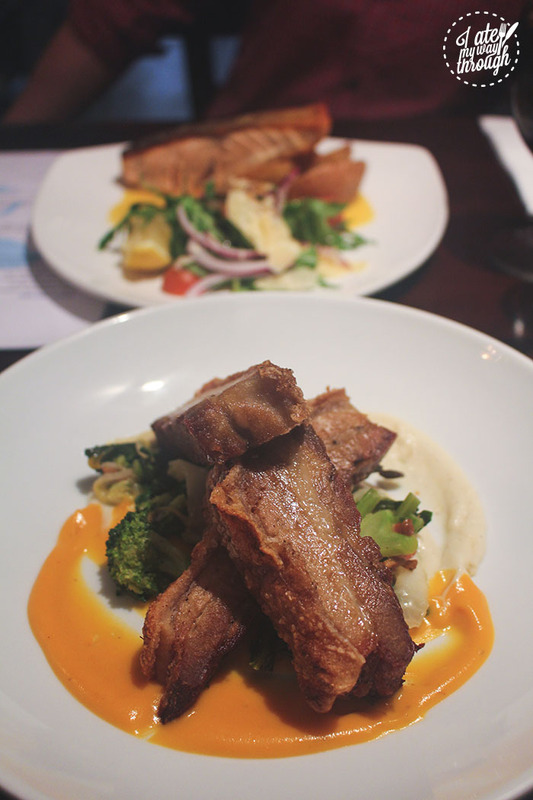 Chinese-style pork belly with garlic butter, bacon, Chinese broccoli, roast sweet potato and cauliflower puree. 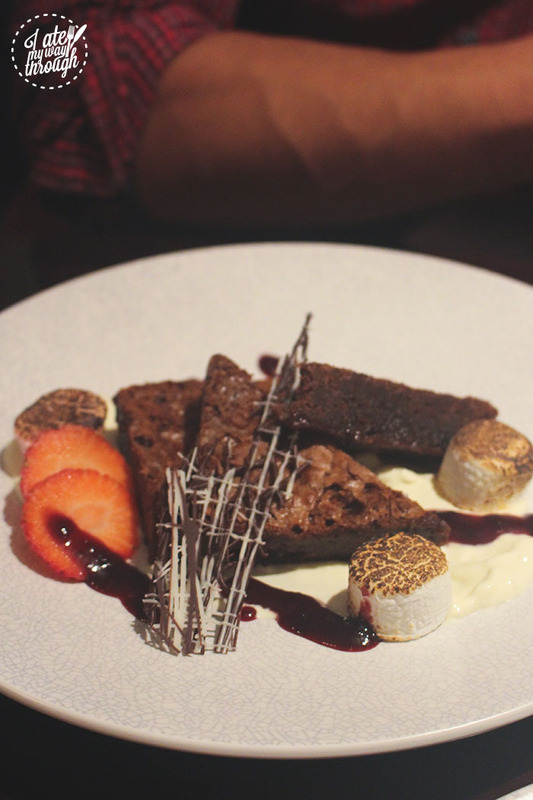 Triple chocolate and cherry brownie, with cherry puree, double cream and toasted marshmallows. Sandpipers offers seemingly simple flavours paired in expert ways, making it a lovely place to enjoy a nice wine and some relaxed but tasty food. 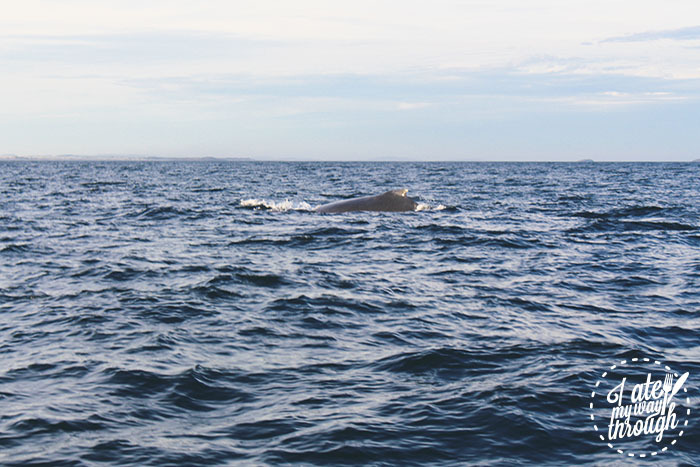 A winter holiday in Port Stephens is perfect for whale-watching season, which runs from May to November – when humpbacks and southern right whales pass the harbour in their annual migration. We took the Fastcat Envision for the Whale Watch Express Cruise, so heading out into the open waters was a quick and exhilarating ride, and allowed more time to actually see any whales moving through the water. We were lucky enough to spot a mother humpback with her new calf, which our guide said was most likely born earlier that day, and even took a quick trip over to an island with a colony of lazing fur seals. 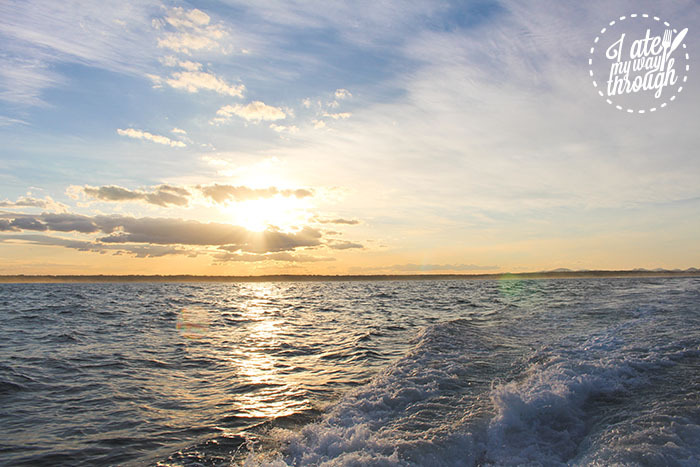 On the way back we were also treated to a flawless sunset over the water, which made for an all-round unforgettable experience and definitely one that no winter holiday in Port Stephens should be without. 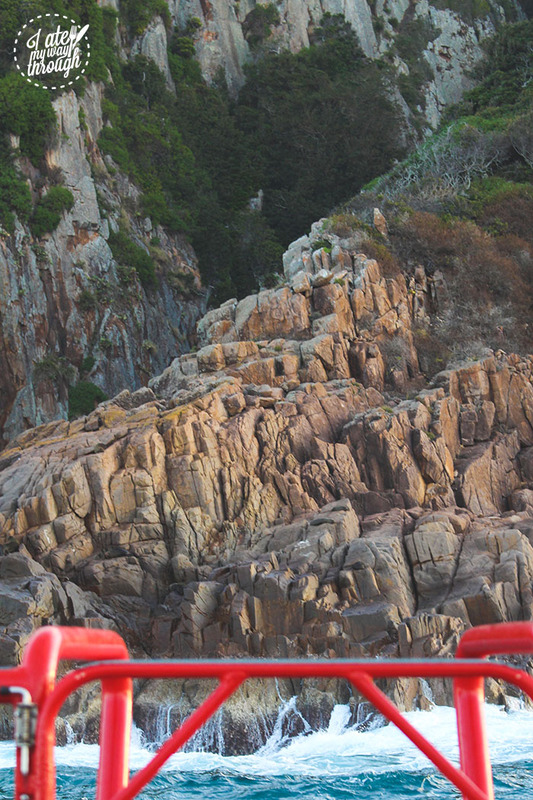 A colony of fur seals lazing on the rocks – a little hard to spot but we promise they’re there! You can also go on the larger whale or dolphin watching cruiseliners which move at a more leisurely pace if you’re up for a calmer experience, but definitely head onto a fast boat if you’re up for more excitement and seasickness isn’t a problem! For those wanting to pick up speed even more, quad biking is a great activity to get your heart racing. I’ll admit that I was a little worried that I would forget the controls or mix them up and end up hurting myself, but it turns out that quad biking is surprisingly easy! 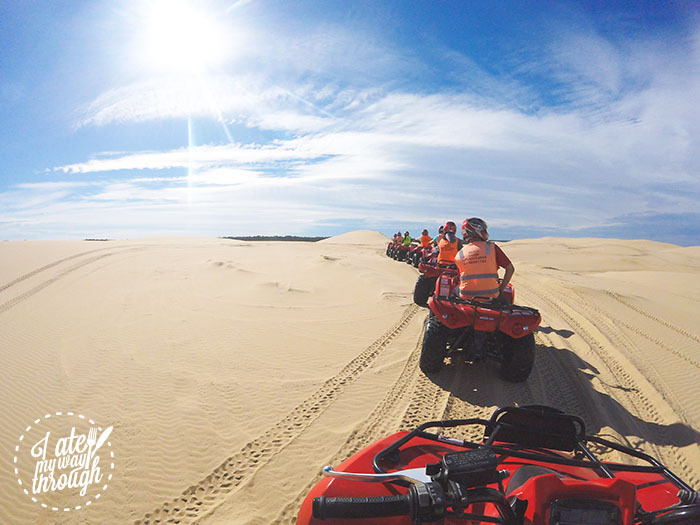 We had our quad biking experience with Sand Dune Adventures, and they really took care of the group and made sure we had a great time while staying safe the whole time. This is definitely one for the adrenaline junkies and thrill-seekers. If you’re afraid of heights you might be a little taken aback by the height of some of the dunes they’ll take you down, but if you can muster up a little courage then it’ll be worth it. Trust me. 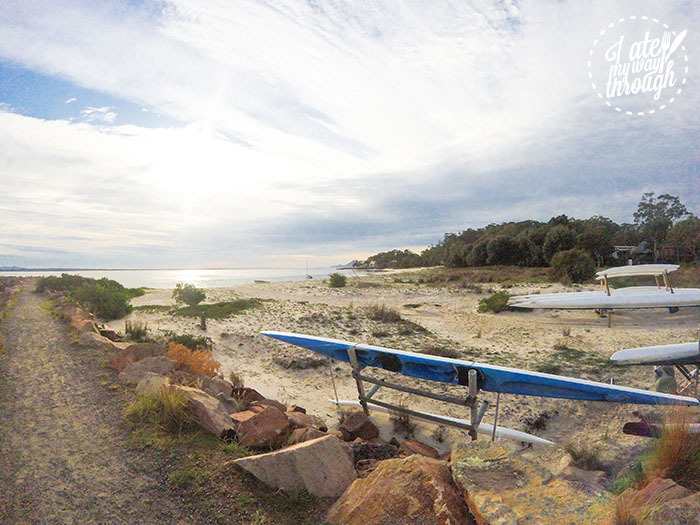 Not only will it be an exhilarating ride, but it’ll also take you alongside some of the most beautiful landscapes in Port Stephens. 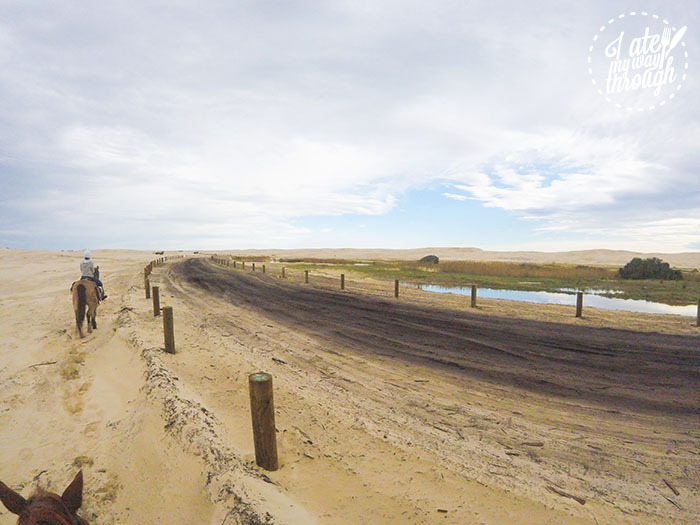 Another, albeit slower, way to get your fill of Port Stephens’ expansive sand dunes is by horseback or camel riding. This is definitely more of a relaxed activity, as you certainly won’t travel as fast as on a quad bike. The most you’ll get on one of the horse rides is a trot, which for those unaccustomed to horseback riding can be a little unforgiving on your backside. The stunning views will have you forgetting the minor discomfort though, as will the fun of bonding with your new hairy animal friend. 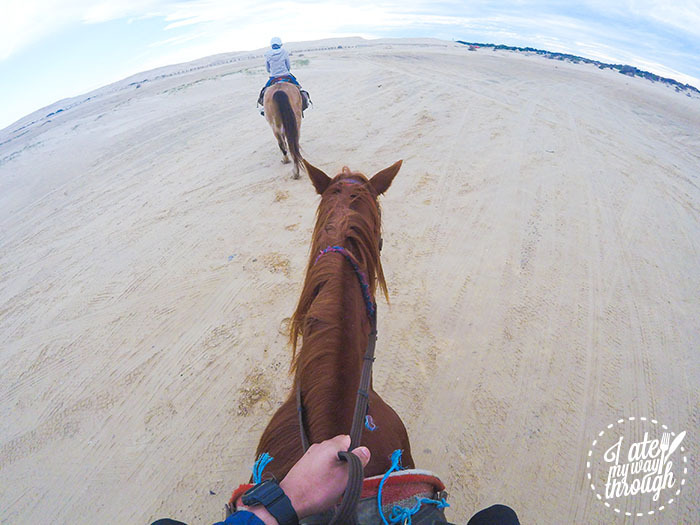 We rode with Sahara Trails in Anna Bay, which departs from Birubi Point and offers a one-hour experience up and down the tranquil beach. The hour-long walk up to the summit of Tomaree Head starts at Zenith Beach and is actually more of a steep climb than a walk. Once you get to the top though, you’ll completely forget about having exerted so much energy and sweat to get there. 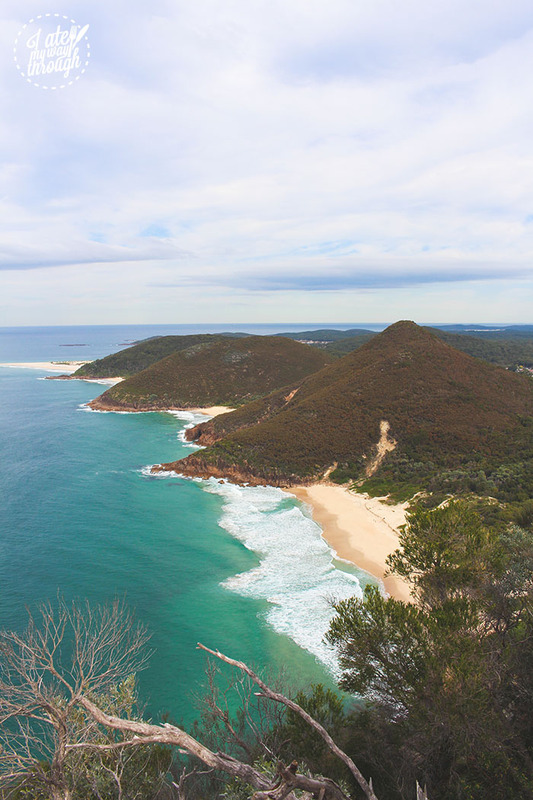 The summit provides panoramic views of Port Stephens and the north coast, and if you bring binoculars there’s a chance you may see a pod of dolphins or whales. It’s quite a popular walk though, so be prepared to share the track and the view with other hikers and families if you go during peak holiday season. This little bit of exercise will be a great break from all the eating you’ll undoubtedly do throughout your stay, and is a particularly good walk for winter. The trees break at various stages of the walk so the warmth of the sun can still hit you without it being too hot and uncomfortable for exercise. For more information, visit nationalparks.nsw.gov.au. 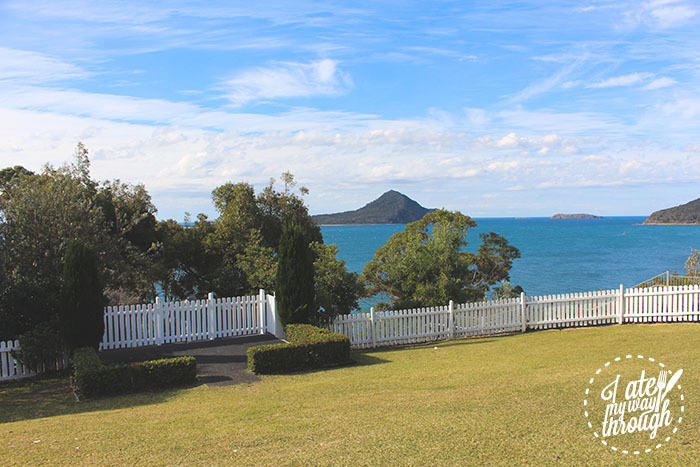 For more information on the Port Stephens area, check out visitnsw.com. 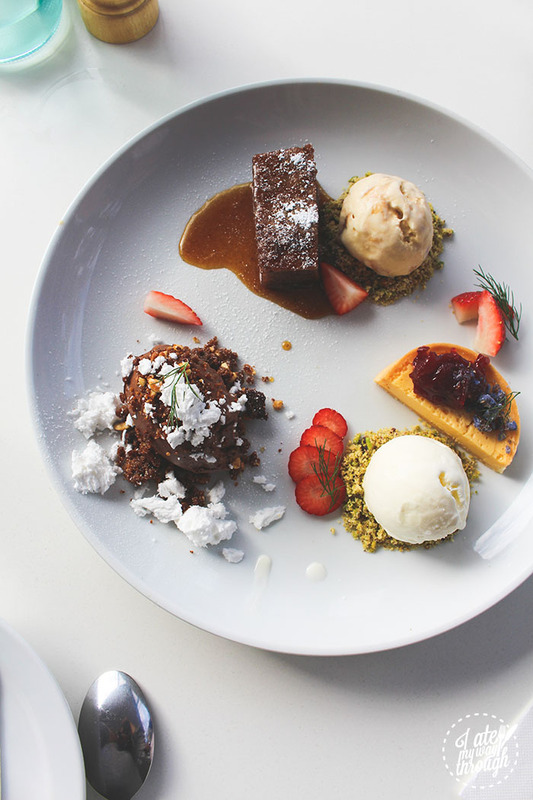 I Ate My Way Through visited Port Stephens as guests of Destination NSW.